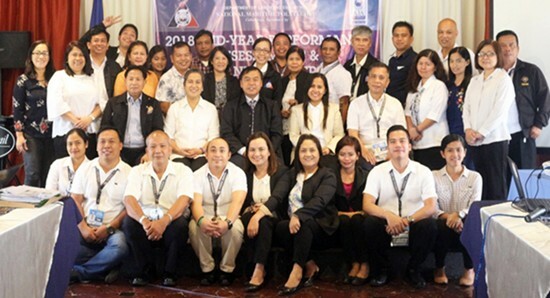 TACLOBAN CITY – The National Maritime Polytechnic (NMP), a premier government-owned maritime training and research institution, conducted its Agency Mid-year Performance Assessment (MYPA) and Re-planning Exercise on 09-10 July 2018 at the Rosvenil Hotel, P Burgos St., Tacloban City. The Agency’s accomplishments for the first semester of CY 2018 were assessed and reviewed vis-à-vis the Agency’s Thrusts and Priorities, performance commitments as contained in the 2018 Office Performance Commitment Review (OPCR), Annual Action Plan, and NMP Strategic Plan. For the past six (6) months, NMP was able to train a total of four thousand four hundred nine (4,409) trainees, comprised of aspiring and active seafarers, maritime instructors, assessors and supervisors and allied workers in the maritime industry. All (100%) trainees were issued with certification within seventy-two (72) hours from successful completion of all course requirements. The achievement was made possible through the implementation of the twenty-six (26) training courses as well as the establishments of linkages and partnership with different local government units (LGUs), Maritime Industry Authority (MARINA), Philippine Coast Guard (PCG), Masters and Mates Association of the Philippines, Inc. (MMAP), and Seabase Training Center for Watchkeeping, Inc. (STCW INC). In addition, one thousand four hundred thirty-eight (1,438) trainees-assessed who requested for Training Completion and Record Assessment (TCROA) were issued with TCROA after completion of the assessment. As part of NMP’s commitment to provide timely and relevant researches, there are two (2) on-going studies which are due for completion within the year. NMP’s completed researches in CY 2017, namely: Skills Gaps Analysis of Maritime Faculty in Philippine Maritime Higher Education Institutions (MHEIs); Gender Sensitivity Training for Seafarers (GSTS) Course: A Program Evaluation; and Responding to the Filipino Seafarers’ Training Requirements in the STCW 2010 Manila Amendments: Challenges and Opportunities were presented to the maritime stakeholders on 22 March 2018 at The Bayleaf Intramuros, Manila. Also, the Agency passed the re-certification audit of NMP Quality Management System (QMS) under ISO 9001:2015 Standard held on March 5-6, 2018 conducted by the Anglo Japanese American (AJA) Registrars Inc. In terms of infrastructures projects, repair and upgrading of the NMP Gymnasium and repair and rehabilitation of Maritime Training Annex Building were completed in March 2018. “We are a family, driven with one purpose and one passion. We have one common denominator which is commitment to our work, commitment to public service for the betterment of NMP and our clientele – the Filipino seafarers. We are half way of the year and towards the end whatever lapses we have, we will try to talk about it and derive a certain phase where we can achieve it towards the end” said Deputy Executive Director Mayla N. Macadawan during her opening message. Apart from the reported accomplishments, issues and concerns were discussed and the proposed strategies were identified to effectively improve performance and achieve targets and commitments for the second semester of CY 2018. “I knew that NMP will be facing a lot of challenges ahead, a challenge to each and everyone of us, a challenge as to whether we are already stepping at the right track. Henceforth, we shall continue to strive, working for the maritime industry” Executive Director Romulo V. Bernardes disclosed in his closing message. Outputs of the two-day session are the validated NMP MYPA Report CY 2018, Second Semester Action Plan CY 2018 and the Report on Actions Taken on Issues and Concerns Affecting Performance which will be reported during the Cluster and DOLE-Wide MYPA and Re-planning Exercises scheduled on 20-21 July 2018 and 26 July 2018, respectively.